A bitter sweet day. 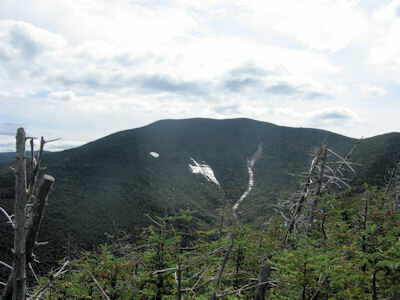 On the one hand I was overjoyed to be heading to the White Mountains with Pinta to climb a mountain that counted toward the NE Hundred Highest list, a bushwhack, and that I would be hiking with friends who knew how to use map and compass. 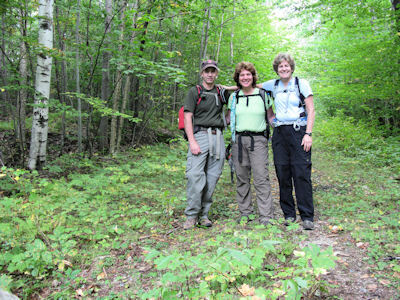 All week I had been anticipating this hike with Eileen and Bernie, so glad they let me know their plans and invited me to come along. On the other hand I was leaving behind two sweet old dogs who had been part of my family for the last 7 years. A week ago Ariel, the female, had had another stroke; she couldn't eat, was almost blind and mostly deaf, confused and couldn't walk straight. Sam was completely deaf and could barely stand to eat his breakfast. They were both 14 years old and today Mary, my housemate, was having them put down. It was time for them to rest. 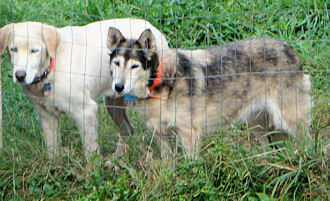 Sam and Ariel came to live with us when Mary decided she wanted to learn how to mush with sled dogs. Nancy actually had a sled she gave to Mary and she tried to learn with these two old sled dogs that had been retired from serious mushing. They were outdoor dogs, had never lived inside a house, and didn't have the same social skills of say Pinta, a dog that lives inside. But they were sweet and brave and loved to go for walks. Sammy stayed very close to us when we walked, his lumbering gate and blue eyes gazing at us at all times, prancing his way down the trail, never straying far. Once Ariel got used to actually walking without a harness or a leash she loved to go for walkies. But she liked even more to explore on her own and sometimes came back to the house before the walk was over so she could eat horse poop or get into some kind of trouble with the trash. I walked out to their pen and there they were, their heads together, leaning against each other, brown and blue eyes, cloudy and open, looking at me, hoping for breakfast. I gave them each a bone and touched them and said good-bye. So it was with tears in my eyes that I urged Pinta into the back seat of my car and we drove to the White Mountains. The drive was quiet. I felt Nancy's absence and I was comfortable with my presence. Alone, I was still ok. I drove right by Bernie's truck that was parked at the trailhead and had to turn around. But first I pulled off the road because I had to pee really badly. I stepped behind my car and started to go when a truck came by and pulled into the turnout too. I skootched around the car, pants down, pee flowing, no way to stop it, cursing. What are the chances of another car driving by when I'm out in the middle of nowhere taking a pee? I had to laugh. We geared up, took our trailhead picture, and started off down the herd path. Bernie had already climbed Peak Above the Nubble, but, unknowingly, had used the herd path that went straight up the side of the mountain, very ecologically unsound, and the 4,000 footer committee asks hikers not to apply for their patch if they hiked via that route. So Bernie was going back for an honor hike, to get it right. I felt good, strong, happy, excited. I also let in the fact that Nancy wasn't with me and how much I love to hike with her. She wrote about that in her trip report called The Space Between Us and I thought a lot about that report as we climbed. Here I was, hiking without her, and I was enjoying it. Not only was I hiking, but I was bushwhacking and enjoying it. I know a lot about the pain of missing people, the pain of losing friends, and I was content on this day to be with me, inside my own skin, hiking with Eileen and Bernie. We reached the start of the bushwhack after about 15-20 minutes of walking. Bernie took out his GPS and took a mark on our exact location then we set the bearing of 40 degrees on our compasses. He took the lead as we headed over rolling terrain and fairly open woods. The going was easy although we never moved more than a few feet in a straight line. He was jigging and jagging trying to find the easiest way through the woods and through the hobble bush. It was kind of fun. I was smiling. We reached the ridge in short order, took a GPS mark and set a compass bearing of 170 degrees and started up along the ridge. I took over the lead at one point on the ridge, and almost immediately found that if I didn't look at the compass every few feet I found myself drifting off to the right. 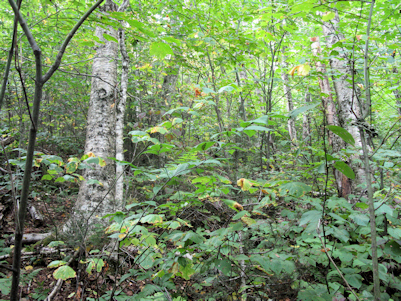 The woods on the ridge were quite open, very few spruce, but lots of hobblebushes to trap our feet as we walked through them. Mounds of moss and leaves and rotting bits made for soft, spongy footing in places. In fact I had to watch out because I postholed a couple of times when I fell through leaves covering holes between rocks that looked solid but were not. The walking grew more and more steep and I felt my calves complaining about the cruel treatment. Occasionally we stopped to rest, but mostly we kept up a steady pace. At the steepest point in the bushwhack we came out and hit the herd path that Bernie knew was up there, which would lead us the rest of the way to the summit. But first we walked left to check out the views and for Bernie to show us the herd path looking like it went straight up the side of a cliff that he had climbed the first time. The herd path, although not officially maintained, was easy to follow and it was beautiful up around 3,000 feet. The path wasn't steep and we walked comfortably up until we found the summit canister. Way cool! The first mountain in years that I have climbed that actually counted toward an official list! I was thrilled. We walked to a clearing and admired the view of the nearby North and South Twin, Mt Hale and the more distant Presidentials. Interesting view. I don't think I've ever seen those peaks from this angle. It felt wonderful to sit in the sun and eat my lunch. Bernie read the entries from the log we found inside the summit canister. Also inside the canister was a laminated piece of paper commemorating the life of Ray Loring, who died of a heart attack climbing Peak Above the Nubble in September of 2008. Eileen read the tribute out loud. Finally we packed up our stuff and started back down. From the place where we had intersected the herd path on the way up we started down another herd path, but that petered out after a few tenths of a mile or so and we were on our own. I led on the way down although Bernie had to correct me a couple of times because I kept heading straight down instead of traversing both to my right and down. At one point, we entered a moose parlor and I saw a single antler lying on the ground. I picked it up to show Eileen and Bernie and they insisted I keep it. Eileen carried it down the mountain for me. We reached a low lying area that must have been logged some time ago because the views were beautiful and the walking difficult as we pushed through hobble bush and thick brush. We followed what looked like a path toward the east and eventually met up with the main herd path that led back to our cars. Pinta was happy to hop in the car and lie down. I was happy to take my boots off and sit down. I waved to my friends as they headed for home and felt a good, warm glow inside my heart. I had accomplished something that I wanted. 11 more summits to go, all bushwhacks. I felt great!